Cottage Industry: Communication, Collaboration, Let’s Beat Poverty and Racism in All Their Forms! Clarification regarding artwork pick-up: We encourage artists and families to wait until the end of the 3-5pm closing reception next month, Saturday, July 25 to take home their artwork or to call Josefa at 415-656-9849 to make other arrangements. Call 415-656-9849 for building entry or to make arrangements for artwork pick-up. We look forward to seeing you Today (Thur) 5pm -7pm at the Thoreau Center! Students in last year’s Summer Intensive stated that the field trip to Royce Harris Vaughn’s home and studio was the most memorable experience of the Intensive. We will miss him at next month’s Intensive. Below are excerpts from his obituary by his wife Judy Vaughn (no relation to Josefa). Tenaciously — with great spirit, and always with just one more larger than life grand idea, one more story to tell — Royce Vaughn lived his declining years as a determined craftsman and dreamer until the end. Even as his health failed, his determination survived. Born in Cleveland, Ohio, and running on the platform of “Royce, the People’s Choice”, he was elected Lt. Governor of Ohio Buckeye Boys’ State in 1948. He was offered full scholarships to Yale, Harvard, Princeton and Antioch. He chose Princeton and became one of its first three full time black students. Stories he told about his experiences there included meeting Albert Einstein, his majors in Renaissance art history and religion as well as his unprecedented integration of the prestigious Quadrangle Club. Artistic skills in the US Army gave him the opportunity to serve as a General’s artist while in Augsburg, Germany, and craft shop director at Fort Ord in California. Once in San Francisco, he worked at Flax Art Supplies and at the San Francisco Chronicle where he and Bonanza editor Ted Brett won a first place Carl J. Nelson Newspaper Research Study award for major daily newspapers. Later, while in the audio visual department at San Francisco State, he was co-creator and first president of the Staff Assembly representing over 700 employees. In the Sixties he founded The Arts and Business Learning Experience (Project ABLE) to provide motivational job training for youth. 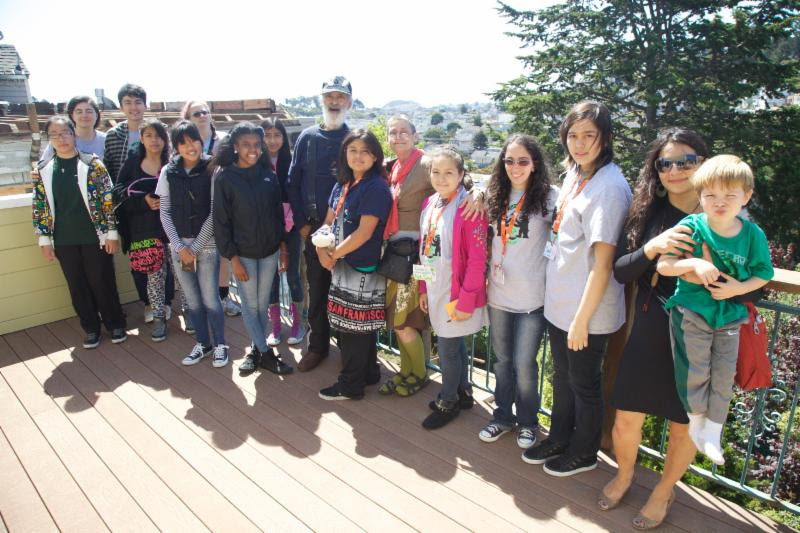 Working with San Francisco State University and the Neighborhood Arts Program, he eventually secured a $196,000 Ford Foundation grant for the project and as much in matching local funds. The ABLE documentary “The Afro-American Thing” illustrated a series of events in local libraries and community centers and was aired on KPIX Channel 5. Now on YouTube, it reflects the excitement and awe of young people being introduced — perhaps for the first time — to poets, musicians, theater and an African dance group. Next came the Oceanview/Merced/Ingleside Business League (OMIBL) which Royce created to encourage and strengthen the small business community in and around Ocean Avenue. He saw the future of the street as a link between San Francisco State University and City College of San Francisco and in 1998 produced a local history book and staged a parade from one end of the street to the other to promote neighborhood unity. Honoring his racial heritage and desire for a more understanding multi-cultural world, Royce created “We Shall Overcome,” a 60″x36″ acrylic honoring civil rights leaders of the Sixties which was included in a 1996 juried show at the Museum of Science and Industry in Chicago. His “Remembering Our Heroes” portraits are of early African-American heroes Frederick Douglass, Booker T. Washington, George Washington Carver and Ralph Bunche. Modern Afrigrams are based on Chinese tangrams and executed in the colors of Africa. His work is listed in Afro-American Artists, Boston Public Library,New Perspectives in Black Art,Oakland Museum,Black Dimensions in Contemporary Art,Carnation Company,1972 McGraw-Hill High School History Reader and the Slide Registry of the University of Southern Alabama. Again, in the spirit of multi-cultural understanding, he and wife Judy hosted guests from the International Visitors Center for almost twenty years. Their dining room table overlooking Noe Valley was the venue not only of spirited family gatherings but of wonderfully satisfying international conversations. Royce leaves behind his brother Albert, wife Judy, daughter Lisa and husband David Olstad, daughter Cassie and husband John Hellman, sons Royce David and Jeffrey Harris, plus grandchildren Wesley, Chris, Amani and Ayana. This entry was posted in ArtSeed by admin. Bookmark the permalink.